For many, the best Star Wars characters aren't people or aliens. The robots --R2-D2 and C-3PO -- steal the show. 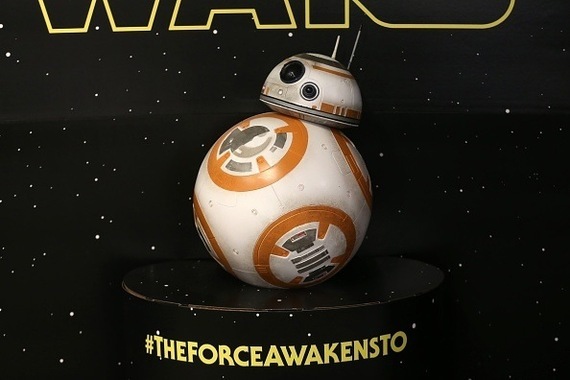 So the appearance of a new sidekick named BB-8 in the trailer for The Force Awakens had many Robophiles in a dither. A robot with a small head compartment sitting atop a much larger ball that it rolls around on seemed like a pretty awesome addition to the high-tech team. Unfortunately, NASA wants you to know they won't be bringing a real-life BB-8 along on space missions anytime soon. According to Brett Kennedy, a roboticist at NASA's Jet Propulsion Lab, in an interview with Wired, it's not that they couldn't make a BB8 twin, it's about whether it makes any sense to do so. Apparently, they're worried about it getting stuck on a strange extraterrestrial ridge. "Trying to roll up and over anything is extremely difficult. If you only have one wheel, you're sort of stuck. The physics just doesn't work out." As for C-3PO and R2-D2, Kennedy thinks NASA could make real replicas today. In fact, he even was so bold to claim that the space agency already has humanoid robots that could outperform C-3PO on many tasks. But here's where I get off the boat with Kennedy. Sure, he acknowledges that NASA isn't trying to build characters, just machines. But that ignores practically the whole point of R2-D2 and C-3PO. Could NASA's droids stop the Death Star trash compactor or gather an entire droid army? How many languages does NASA's humanoid speak? C-3PO has long claimed over six million. It's nice when our scientists are proud of the work they do, but they really shouldn't get ahead of themselves. There may be some impressive people on Earth today who could rival Luke Skywalker and Hans Solo for bravery and ability, but we all know we're a long way away from producing an R2-D2 or C-3PO -- whether NASA wanted to or not.